A loan of $900 helped to buy clothing, shoes, and wallets. Ms. Sarait is a member of the "Shipibas" communal bank in the district of Calleria, department of Ucayali. She is 37 years old, married, and has one young daughter. She has a business that she runs out of her own house. She sells clothing, shoes, and accessories for women. She has been working with Manuela Ramos loans for two years. 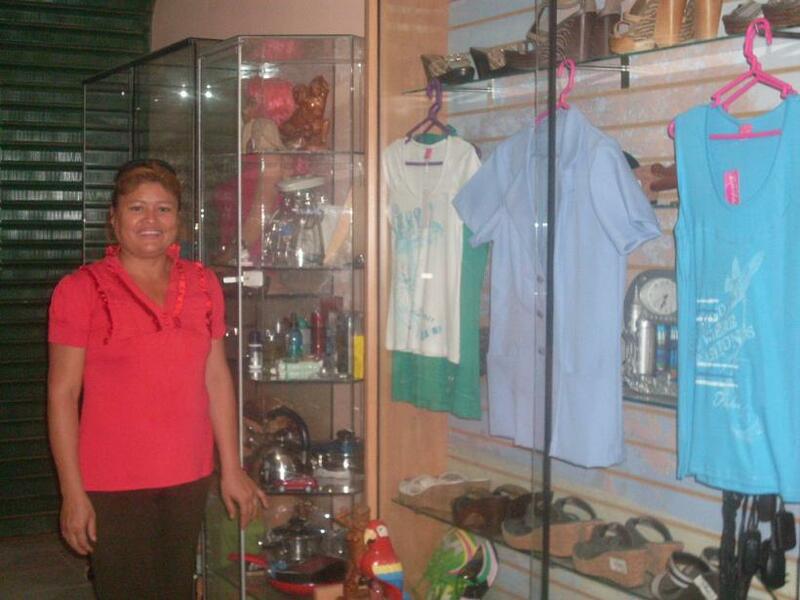 With her new loan of 2,500 nuevos soles, she will buy six blouses, nine pairs of shoes, five wallets, six pairs of pants, six pairs of shorts, and one mannequin. She is in the process of formalizing her business. She used to just sell to her friends, but now she has her own storefront and hopes to have all of the papers to open her location soon. She only hopes that it will go well and that Manuela Ramos will continue offering her loans so that she can further develop her business. Translated from Spanish by Kiva volunteer Katie Kavanagh. View original language description. La señora Sarait es socia del banco comunal Shipibas del Distrito de Calleria, departamento de Ucayali. Tiene 37 años de edad, está casada y tiene una hija menor de edad. Tiene su negocio que funciona en su propia casa, ella se dedica a la venta de ropas, zapatos y demás accesorios para damas, lleva 2 años trabajando con los préstamos de Manuela Ramos. Con su nuevo préstamo de S/. 2,500.00 nuevos soles comprará 6 blusas, 9 pares de zapato, 5 carteras, 6 pantalones, 6 shores, 1 maniquí. Esta formalizando su negocio, antes vendía ofreciendo a sus amistades, ahora cuenta con un local propio y espera contar con todo sus documentos para poder abrir su local, solo espera que le vaya bien y que Manuela Ramos siga otorgándole los préstamos para ir implementando mas su negocio. Kiva decided to support Manuela Ramos as they are 100% focused in defending women’s rights and in empowering them. Their microfinance program follows such strategic orientation with loans made only to women in 6 regions across Peru. Partnering with Kiva not only enabled them to decrease their cost of capital but also allowed them to reach more rural and poor areas. Their main focus is the Puno region, one of the poorest of Peru with nearly 40% of their loan portfolio concentrated in that area. They also recently have opened a new branch in the Amazonas region, an isolated and ‘unbanked’ part of Peru.